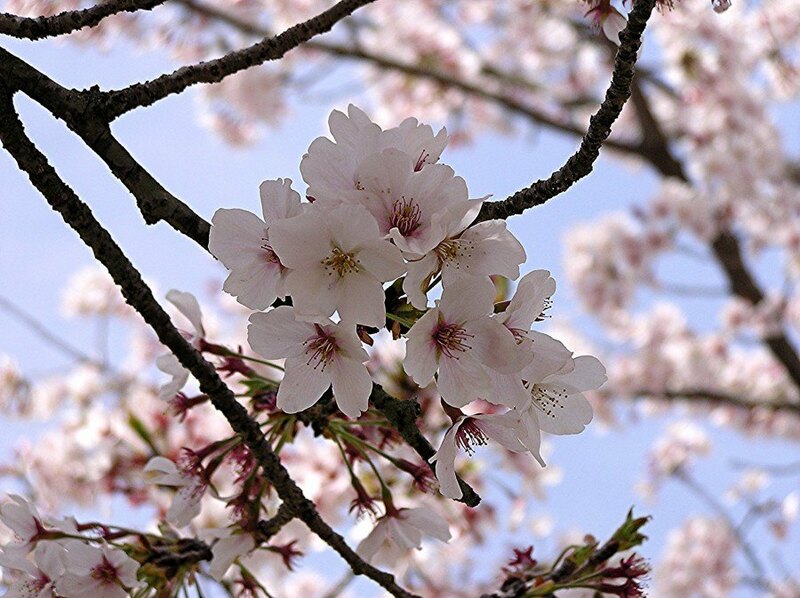 To the Japanese, cherry blossom is much more than just a few flowers. It’s hard to explain to those who haven’t experienced it, but during the sakura (cherry blossom) season, the whole country is swept by a sort of festival atmosphere that lasts from the first flowering down in southerly Okinawa until the last petal drops in northern Hokkaido. As the blossom front sweeps along the length of the archipelago over the course of several months, the shops fill with sakura-flavoured drinks and snacks, the blossom report becomes more important than the weather forecast, and people flock in their droves to the most popular hanami (flower-viewing) points to lay out tarpaulins beneath the trees and generally eat, drink and be merry. All this means that although it is the busiest time of year for tourism in Japan, it’s also one of the nicest – with lovely weather, beautiful landscapes and a relaxed, party-like atmosphere everywhere from the biggest city to the smallest of rural villages. But where best to make the most of the phenomenon of sakura? Well, it depends who you ask. Everybody tends to have their own favourite spot, whether it’s one of the famous destinations or just their family garden, so this is not a “top ten” list – only a few suggestions. You’ll have to find your own favourite by yourself! One must either be very brave or very stupid to venture to Yoshino during peak cherry blossom season. Covered in over 30,000 cherry trees, it’s the most famous sakura viewing spot in Japan and has been for hundreds of years. The route most visitors take to view the blossoms snakes from the railway station at the foot of the mountain ridge, passing through four distinct sections (the Shimo Senbon, Naka Senbon, Kami Senbon and Oku Senbon), with various parks and viewpoints as well as lots of yatai food stalls along the way. Though it does get overwhelmingly busy, I visited Yoshino on a weekend in peak season in 2014 and I do think that it’s worth the effort – especially if you take a few pieces of advice along with you! Firstly, arrive as early as possible to avoid the worst of the crowds. You might even consider staying at a ryokan on the mountain itself so that you can enjoy the blossom in peace, just after sunrise. If you’re planning to eat lunch at a local restaurant, eat early to avoid the massive queues at lunchtime – or do what I did and just buy lots of delicious snacks from the yatai food stalls along the way. Bringing a picnic is another great alternative. Lastly, be sure to reserve a seat on the train home! Standing up all the way back to Nara or Kyoto after a day of hiking is not the one – as I found out to my detriment. Check out my post from last year for more tips! Since the vast majority of people who visit Japan will visit Tokyo, where better to suggest than the capital’s very own Shinjuku Gyoen – a large park located right at the heart of the city, within walking distance of one of its largest and busiest entertainment and business hubs. Tokyo is famous the world over as a hyper-modern metropolis packed with high-rise buildings and flashing neon lights, and whilst this is true – there is also a surprising wealth of green spaces where you can take time out from the hustle and bustle of the city to relax. One of the best places to see cherry blossom in Tokyo is undoubtedly Shinjuku Gyoen, which is home to over one thousand cherry trees of both early- and late-blooming varieties, meaning that the sakura season here lasts longer than elsewhere in the city. Other lovely sakura spots in the city include the Imperial Palace Gardens, Hamarikyu Gardens and Ueno Park – so be sure to try out a few. Fully re-opened this year after a five-year facelift, Japan’s largest and most impressive castle is also a wonderful place to see the cherry blossom. This UNESCO World Heritage Site has survived fires, wars, earthquakes and the Meiji Restoration to be one of only a handful of original feudal castles still standing in Japan – and 2015 is an especially good year to visit following its hiatus from the tourist trail. Surrounded by sakura trees, Himeji is undoubtedly at its best in the spring! The only thing better than one Japanese national icon is two Japanese national icons – and for a couple of months each year you can get two for the price of one as Mount Fuji is surrounded by cherry blossom. There are numerous places from which to view Mount Fuji, but our favourites are Hakone and the Fuji Five Lakes region. Fuji Five Lakes is perhaps better than Hakone when it comes to sakura, and two of the best spots are the northern shores of Lake Kawaguchiko and the Chureito Pagdo, built in the hills of Fujiyoshida City. Kyoto’s Philosopher’s Path is a lovely stone walkway that follows a canal through the northern part of the city’s Higashiyama district. It gets its name from a particular philosopher – Nishida Kitaro – who was said to wander down the path in meditation on his way to Kyoto University. The path runs for about two kilometres and as well as plenty of restaurants, cafes and shops it is lined all the way with cherry trees, which explode into colour in early April – providing one of Kyoto’s most popular hanami spots. Other famous hanami locations in Kyoto include Maruyama Park, with its giant weeping cherry tree; the Arashiyama district on the outskirts of the city, famous for its bamboo groves and monkey park; and Heian Shrine, where the weeping cherry trees bloom a few days later than in the rest of Kyoto – making it a great option for visitors who have missed peak season! Acknowledged as one of the top three landscape gardens in Japan (and widely considered to be the best of the three), Kenrokuen Garden in Kanazawa is a beautiful place to visit at any time of year – but especially so during the cherry blossom season. The garden is so large that you could easily spend a couple of hours wandering through it, and at closing time if you listen very carefully you may hear the voice of InsideJapan’s Richard Farmer over the loudspeaker politely asking you to leave! As well as having lots of sakura trees within the garden, there are plenty more surrounding it – especially at nearby Kanazawa Castle. Kanazawa itself is one of the hottest Japan destinations for 2015, what with its shiny new bullet train line, beautiful station, beautifully preserved traditional districts and cutting edge 21st Century Museum of Art – so there’s no excuse not to make it part of your itinerary. Miharu Takizakura, (lit. “Waterfall cherry tree of Miharu”) is located near the small town of Miharu in Fukushima Prefecture, in the northern Tohoku region of Japan’s Honshu main island. Over one thousand years old, 12 metres tall and with a trunk circumference of 9.5 metres, this massive weeping cherry tree is probably Japan’s most famous tree – and is thought by many to be its most beautiful. As the Japanese do very much like to rank things in lists, it comes as no surprise that Miharu Takizakura tops both the “five great cherry trees of Japan” and the “three giant cherry trees of Japan”. Furthermore, according to Wikipedia, “polls frequently rank it as the number one tree in all of Japan”. One does have to wonder how often Japan needs to take polls about its trees, but anyway. It’s a pretty nice tree, I’m sure you’ll agree. Considered to be one of the top three cherry blossom viewing spots in Japan (here we go again with the lists), Hirosaki Castle at the northern tip of Honshu main island is a wonderful place to see in the sakura. Since it’s so northern, the blossoms come out rather later here than in more southerly regions, making this a great spot for those who arrive in Japan too late to hit peak season elsewhere. From around late April each year, Hirosaki Park is tranformed into a pink wonderland with over 2,500 cherry trees, cherry blossom tunnels, evening illuminations, moats turned completely pink with petals, lovely picnic areas, and rental rowing boats combining to create a truly magical hanami location. 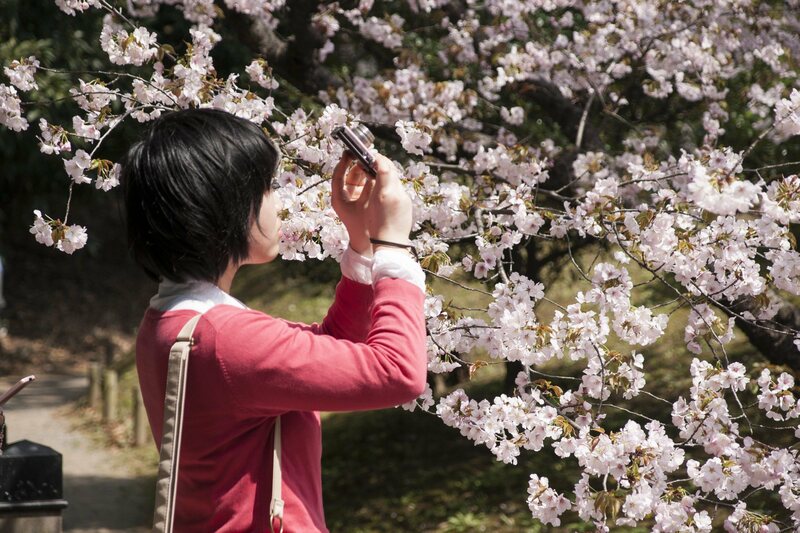 If you visit between April 23 and May 5, you will also catch the Hirosaki cherry blossom festival. Unfortunately Hirosaki Castle is currently undergoing renovations planned to last around a decade, but the park will be a lovely place to see the sakura this year nonetheless. Another entry from the northern Tohoku region of Japan, Hanamiyama Park (lit. “flower viewing mountain”) lies on the slopes surrounding a rural farming community in Fukushima Prefecture. The park was started by local farmers who began planting ornamental plants and trees in the area, and was opened to the public in 1959. 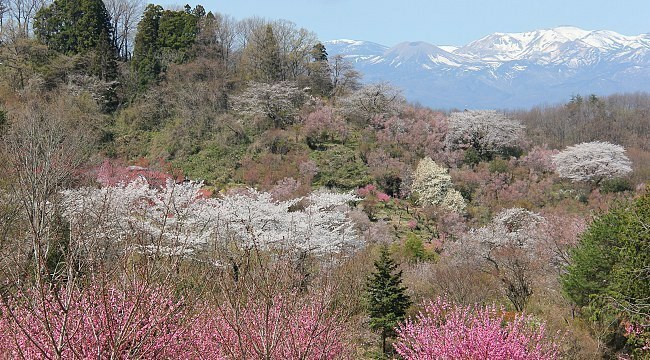 The variety of types of cherry tree and other flowering trees mean that there are actually a wide range of spring colours in the area, with lovely views of the Azuma Mountains in the distance. Visit the visitors centre at the entrance of the park to pick up maps with suggested walking courses and viewing points that look out over Fukushima city and the surrounding valley. 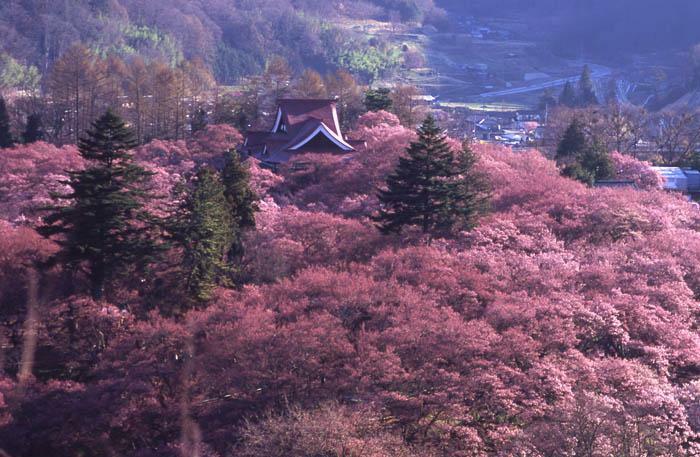 Last but certainly not least on our list is the Takato Castle Ruins Park in Nagano Prefecture, the last of the official top three cherry blossom spots in Japan (along with Mount Yoshino and Hirosaki Castle). Located on a hill in Ina City, Nagano, the park is about 60 km from Matsumoto (where the “Black Crow” Castle also provides a great hanami location). Visit during the month of April and you’ll find yatai stalls set up all around the park for the annual cherry blossom festival, and there are lovely illuminations held every evening from sunset until 10pm. 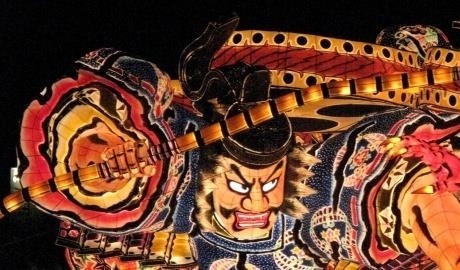 As with many of the spots on this list Takato Castle Park gets super busy during sakura season, so you’d be well advised to visit early in the morning and to avoid weekends unless you don’t mind crowds! Within the park, the curved Onkyo Bridge is one of the nicest points during cherry blossom – but there are plenty of other beauty spots if you take the time to wander around. 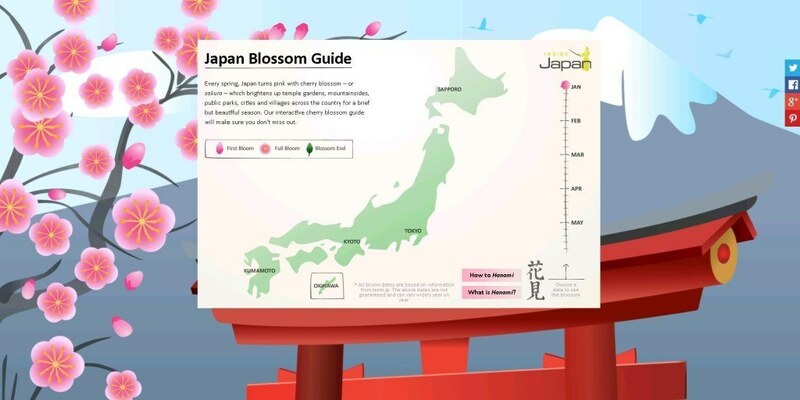 If you’re planning a spring holiday to Japan and want to know whether you’ll catch the sakura, we’ve produced a super-duper new cherry blossom infographic to keep you interactively up-to-date. Click the link above and slide the slider to see when the sakura is expected in each destination. Check it out!